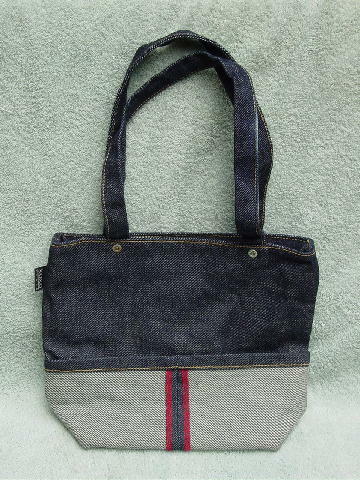 This blue jean purse/tote is 100% cotton and has the leg rolled up 4 1/8". The interior bottom has a 4" wide (feels like plastic) panel to give the bottom and body support. 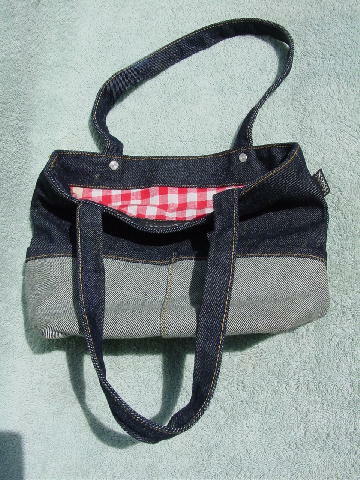 The lining is in a red and white checkered pattern. It has two 20 1/4" long by 7/8" wide handles. The handles are attached by XOXO logo rivets. The front roll up is sewn in the center vertically to the front.